London: The Folio Society Limited to 1,000 numbered copies. Blake is perhaps the greatest, and certainly the most idiosyncratic, of all English Romantic artists. The 116 watercolours that he created for Thomas Gray's poems are among his greatest achievements. 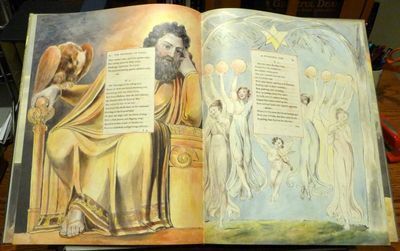 Reproducing all 116 watercolours, this new Folio Society facsimile captures the breadth and beauty of an enthralling work. It is accompanied by a commentary volume containing Irene Tayler's 1971 book, Blake's Illustrations to the Poems of Gray, which remains the most authoritative analysis of the illustrations. Quarter leather binding with cloth sides, printed and blocked with a design from Ode to Music', redrawn by David Eccles. Endpapers of Curious Metallics gold leaf and Marcate Nettuno Carruba. Printed on Modigliani Insize Candido paper. 120 pages. Book size: 17½" x 13". Commentary volume bound in cloth. Set in Miller Display. 224 pages plus a frontispiece portrait of Blake by John Flaxman. Book size: 9½" x 6". Both volumes presented in a buckram-bound solander box. Already sold out from the publisher. Offered at the original publication price. [Please note: Standard shipping within the US at our default rate. No Priority or international shipping on this large and heavy item] . Limited Edition. Hard Cover. As New.